Personally, I am not really into savoury muffins at all. However, what I am very much into at the moment is food that is portable, self contained and freezer friendly. This means that, with minimal planning, I always have something I can feed to the Eating Machine (that’s the baby) at relatively short notice. 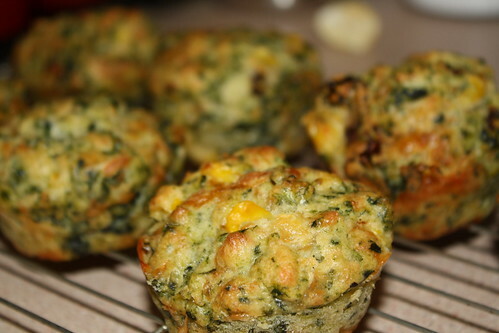 So I now love savoury muffins because I can pack all manner of stuff into them and they take only a morning to defrost. I’ve been doing quite a lot of experimenting and have found that many recipes end up being a little heavy. However, this recipe, cribbed from the back of a pack of Coles own brand frozen corn*, produced light muffins that froze well. The recipe claimed it would make 12. Coles’ home economists must make giant muffins because I halved the recipe and ended up with 9 regular muffins. Another good thing about muffins is that they don’t require the use of the food processor (so you can make them while babies are asleep without any fear of waking them!) – and in fact it’s imperative to keep your mixing as light and as minimal as possible. Overwork the batter and then you will indeed get heavy muffins. Perfectly good while still warm, but even better when frozen and thrown in the nappy bag when heading out for a coffee! * Please note that this was AUSTRALIAN corn. Always check your frozen veggies for country of origin – you could well be shocked – and don’t forget to buy Australian. You can either print this recipe, or download the pdf. And if your little ones are enjoying this recipe, please share it with your friends! Preheat the oven to 180° fan and lightly grease your muffin pan. Mix the dry ingredients and wet ingredients in separate bowls and then mix the wet ingredients into the dry. Don't over work - mix until they are just combined. Spoon into the muffin tray and bake for 15-20 minutes, or until golden. Yes Alex, a good tip. Always check country of origin. Bought McCain frozen corn from Woolworths and used it tonight. I noticed the corn looked a bit “different” than normal, some kernels were discoloured. I Checked the label and it said Product of New Zealand. I have read articles about products made in NZ which can come from anywhere in the world. I was shocked. Buyer beware. The “Product of NZ” thing is really irritating. The other tricky thing is that just because the corn/peas/whatever was Australian last time it does change so you end up having to check every single time … can make shopping a bit long winded!